Thought I switch it up here and cover a different type of game and so I give you Onimusha 3 Demon Siege. Please be mindful that this game is rated M for mature. Definitely not a kid’s game considering the amount of gore in this game. But on with the show. Onimusha has been a franchise I didn’t see myself being a fan of. It was one of those games you pick up just for the sake of playing something new. And that’s pretty much what happened to me with Onimusha. I do hope they make another Onimusha after Dawn of Dreams. It’s a good franchise so Capcom I hope you are reading this. Please make another Onimusha. Me and all the other fans would be very happy. Above all else fans enjoy the Onimusha 3 opening video. Enter Takeshi Kaneshiro a singer from Taiwan, who is the Samanosuke Akechi actor. Your epic swordsman who has slain the demons and transformed into the powerful Onimusha! And this guy Nobunaga Oda get’s revived and you gotta kill this guy before he releases all the demons world wide. No bueno.But these guys somehow were able to travel through space and time and thus France is now under attacked regardless of modern weaponry. Enter Jacques played by the famous actor Jean Reno, the same guy who was in the 1998 Godzilla movie. So if he can handle Godzilla then going up against demons shouldn’t be to bad right? Yeah well to make matters worse Jacques get’s throw back in time Just as Samanosuke get’s thrown into the future, go figure. Almost like Ape Escape, so you play in both the past and present while both protagonists need each other to survive and get back to their own times. This game was rather enjoyable for the controls and movement was pretty much the same compared to the two previous onimusha games. Of course the weapons change but the obvious noticeable difference was Jacques’ whip. This did put a new twist on things. It was nice to use at first but it did get a bit annoying to use. Especially when trying to time the critical hit attacks when needed. Definitely during the times when being outnumbered. Though I did enjoy how you had to set things in motion in the past so you can proceed with the future. So it was a nice duality setting and gameplay which was kind of innovative for the Onimusha franchise. Of course it was a blast to transform into the Onimusha mode. Weapon wise I was rather pleased because again with playing with two protagonist each wielding different base weapons, I’m sure the game developers had a lot of room to test the limits of the functionality of the game. I’m not much of a light or heavy weapon user. So I prefer the balanced weapon and improvise the rest. I’m also glad they kept most of the game the same but with key tweaks that made it enjoyable so much so you enjoyed playing this game around two even three times around. The bonus material was fun as well and let’s not forget the level where you fight to what seems to be until oblivion and then you acquire the genma sword. If you love spamming this is the sword to get. Now there is also some 1st/3rd person shooting for there is another character Jacques girlfriend Michelle. This really threw me off guard since naturally when using a sword and whip through most of the game and the boom you’re not using a gun. So definitely threw me off guard in terms of strategy. Comparing this game to the two prequels and the sequel Onimusha Dawn of Dreams. If you’re looking for more of a movie based based then play this game. If you want to keep to towards the anime side then play Onimusha Dawn Of Dreams. 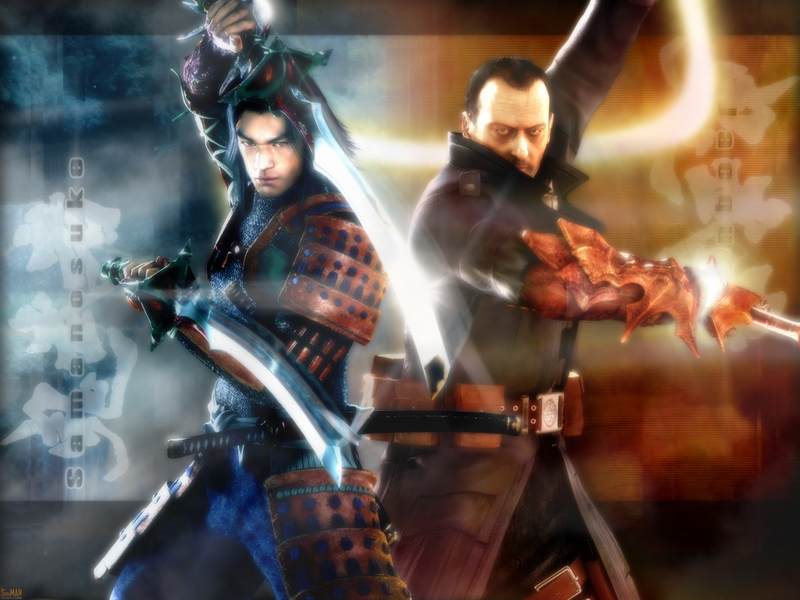 For Onimusha Demon Siege is a bit more westernized or Americanized, however you want to call it. Me personally, since I normally didn’t have someone to play with all the time I pick Onimusha 3 since there is no partner system compared to Onimusha Dawn of Dreams, which I will cover in the future.